This recipe…no, this experiment…caused more trouble than any other I’ve ever made. The bother started in the butcher’s shop. I asked for a pig’s head. The butcher, seemingly used to such requests, went and got a pig head, slapping it down on the block. It was spotted by the woman behind me in the queue, who screamed. I asked her what was wrong and she told me that she didn’t like to think of pigs having heads. I asked her what she thought they had where their heads should be and she mumbled something about not wanting to think about it. All the while, the butcher stood there rolling her eyes and giving me a knowing look. So, I went home with a pig head in a bag. At home, Ethan displayed the sense of morbid curiosity that befits an eight year old, but others wouldn’t entertain the idea of even having the head in the house. This all shows a huge disconnect between the neat plastic wrapped trays of meat from the supermarket and the real world of butchery. In one world, a pig doesn’t have a head or trotters, in the other – the real world – it does. I must admit to some uneasiness about this. I was unsure how I’d react to cooking something with such a distinctive, well, face, but I found that once things got underway, it all became very matter of fact and practical. The pig itself was long dead, anyway, and it would be even more insensitive not to use everything it had to offer, I argued, head included. Nose to tail eating, nose to tail eating, Fergus Henderson would be proud, I kept repeating to myself. The real truth is that anybody who eats sausages also eats pig’s head, because the head has plenty of meat on it, particularly in the cheeks. No butcher worth his salt lets this go to waste. It just gets repackaged into a more palatable, less controversial form. cookbook, and has its roots in Korean cuisine. The first practical problem is the pan. You need a big pan to simmer the head in. You might be surprised just how big a pan you actually need – a pig head is an awkward shape. Mine ended up submerged with the snout poking out skywards. This image obviously did nothing to calm the general sense of freaking out in the house. The head needs to be simmered for three and a half hours, covered in water, or as near covered as you can manage. Add a couple of sliced carrots, a halved onion and some bay leaves to the water for extra flavour. Depending on the size of the head or pan, you might need to move things around or turn it all over half way through. When the head is cooked, carefully lift it out of the pan and stand it in a big bowl to drain and cool for a few minutes. The remaining poaching liquid might be useful for an impromptu soup of some sort, but only if you like your soup to be ultra-piggy…this is the pure, distilled essence of pig, and, really, it’s too much. Don’t feel bad about throwing it out. When the head has cooled enough for you to be able to handle it easily, start to pull the meat away. There’s no easy way to talk about this. It’s gruesome, but fascinating in a slightly macabre sort of way. You’ll need three bowls – one for meat, one for fat and one for rubbish. Most of the meat is in the cheeks, but there are big pockets in the neck and elsewhere. There’s a fair amount of meat on an average head, and it’s very good pork. The cheeks in particular are a fine cut. The fat, and by this I mean the fat and skin, needs to be reserved. Anything that looks dubious, unappealing or just plain wrong goes in the rubbish bowl. If you’re in any doubt, it goes in the rubbish bowl. It’s best to wear a pair of rubber gloves for this – it’s a messy job. This is the difficult part. You need to get the meat and fat rolled up into a nice tight cylinder. First, though, check the seasoning of the meat. It’ll need more salt. It’ll also need garlic – quickly fry a couple of tablespoons of finely chopped garlic in groundnut oil and mix it in. Next, cover a large stretch of work surface with cling film, about a metre by sixty centimetres, and lay the reserved fat out to form a wide bed across the middle. 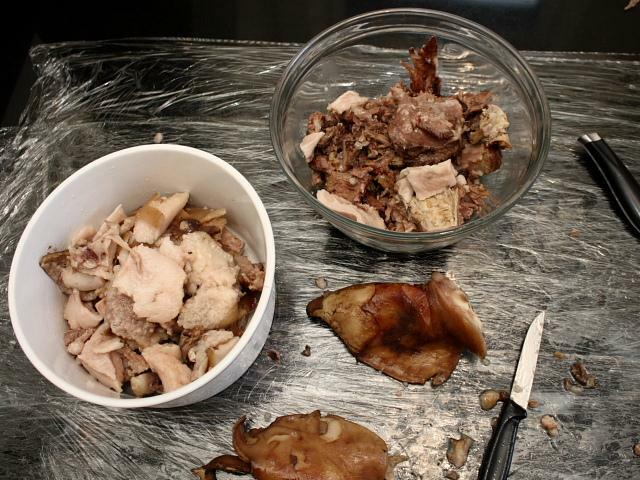 Make sure that the fat is chopped up into bite-sized pieces. Lay the meat on top of the fat, evenly. Again, make sure that the meat is chopped up properly. To roll the torchon, lift the front edge of the cling film and fold it across the meat, lifting and rolling the contents over. Tuck the cling film in on the far side and start to tightly roll it all together. There will be some trial and error involved. The end result should be about six or seven centimetres in diameter. Tie one end of the roll and work the meat down so that it’s tightly packed and then tie the other end. Wrap the torchon in more cling film to keep it all nice and sealed, and put it in the fridge for a good few hours or overnight. The torchon will sit quite happily in the fridge for a few days, and it’ll freeze very well at this point. When you’re ready to go, unwrap the torchon and cut it into two centimetre thick slices. 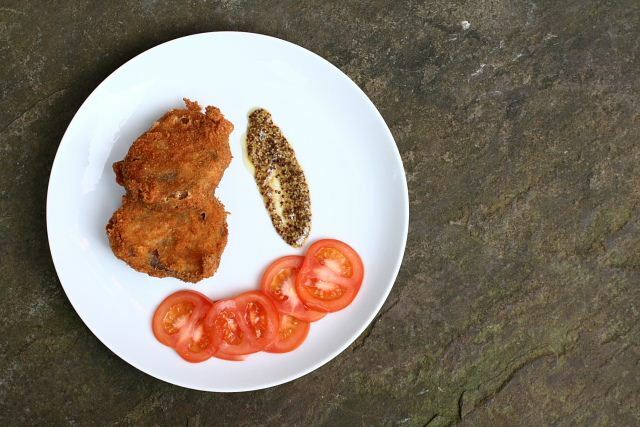 Dredge each disc in flour, dip in egg and then coat in fine breadcrumbs (panko is best) and deep fry for three minutes. Some sort of mustard vinaigrette would go very well with this. The torchons are crisp and brittle on the outside, soft and tender on the inside. The pork is meltingly soft, and something acidic helps to balance the essential fattiness of it all. You don’t need much more. Some simple salad leaves or a few slices of tomato just about do the trick. Whatever you serve, think ‘clean’ – you need to counter-act that fat. 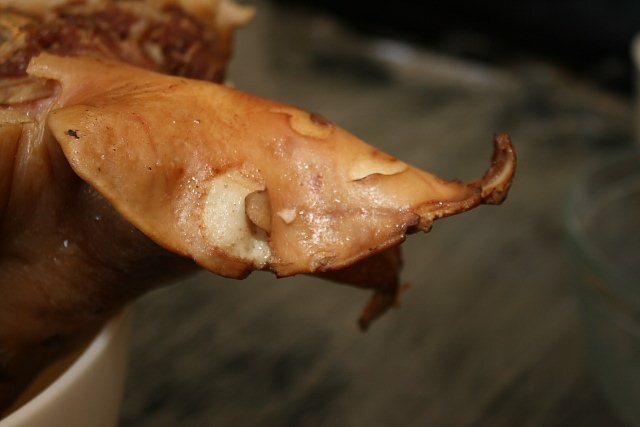 I must say, that picture of the pigs head gave me a little scare. But the after math of it all looked so delicious. I would have a field day with that. Some of the best pork meat is on the head. Amazing write up and pictures. Cheers! Were I not already in bed recovering from four pints and some serious Thai (involving (tiny) fish heads, by the way), I would stand up and applaud. Did anyone else join in, or was this a meal for one? I'm taking a solo trip to London in a few weeks and having lunch for one in St. John. Have you been? I'm very excited to try some hearts or tongues or kidneys. But not tripe or chitterlings, I grew up around those and never want to smell them again much less eat them. Wow that's some serious cooking and butchering! Beautiful. Good work. We just made headcheese and it is a mess but well worth it. Yours looks so tasty! Great post – a great read! They look delicious and I've got a hilarious mental image of a boiling pan of water with a pig's snout poking out the top like a strange snorkel! That actually looks really delectable. I was very entertained by your pig head cooking skills. My butcher actually sells that but I haven't got the courage to buy, let alone cook one. That was very funny and a pleasure to read. Thanks for brightening my day. I agree that it is very sad, well, more than sad, that young people nowadays have largely lost contact with food sources and regard supermarkets (excuse me while I retch) as the source of food.They are the losers, they are the ones who lives need real enrichment and not electronic . . . . .whoa, this is getting out of contol! . . .I must stop. . . too much pork. Great article. I would love to do this with a pigs head. I grew up on a farm and so am totally unsquemish but unfortunately I think it would turn my poor husband off pork for life. I read somewhere that the eyes should not be consumed–any thoughts on that? Kudos for seriously taking on the head-to-tail endeavor. There's nothing that's strictly inedible, but I'd throw the eyes in the rubbish bowl…. The Norwegians have developed a whole drinking culture based on counteracting fatty pork. Aquavit, drunk with the Christmas Eve roast belly ribs in many southern parts of Norway, is like paintstripper and a totally acquired taste. My husband has acquired it and I'm sure would value an apprentice. They also have a whole host of animal-head related recipes. *parts of this might be slightly untrue. 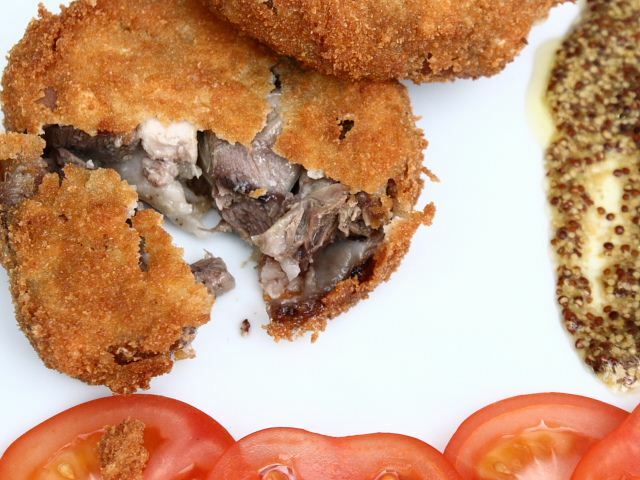 Try googling 'smalahove' – there's no disguising its sheepy origins when you serve it. 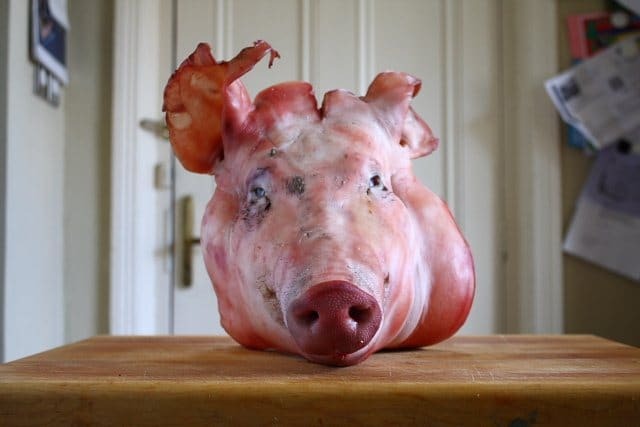 It is eaten frequently enough for the Internet to be a reliableish source of recipes, but if you find yourself staring at a sheep's head and an incomprehensible recipe get in touch and I'll see what I can find/ who I can ask. This may need to happen when your wife is out of the country. I've Googled it, and I regret doing so now…. What a great blog. Love it! Next time, cut your (your pig's that is) head in half. I've only done this once, but my head (my pig's head) was halved for me. Yes, I should have done that, but, in all honesty, I really didn’t fancy watching a pig’s head go through that vicious looking band saw at the butcher’s…. You didn’t mention the brain. Did that go in the final mix? If so, how did you extract it from the cavity? I used to watch my grandfather making brawn and pressing it in a large bowl afterwards. I’ve recently acquired a taste for it. Gunther at the deli in Bradford Market sells some lovely thin cut brawn – quite sweet and gelatinous.